FHA Minimum Property Standards. 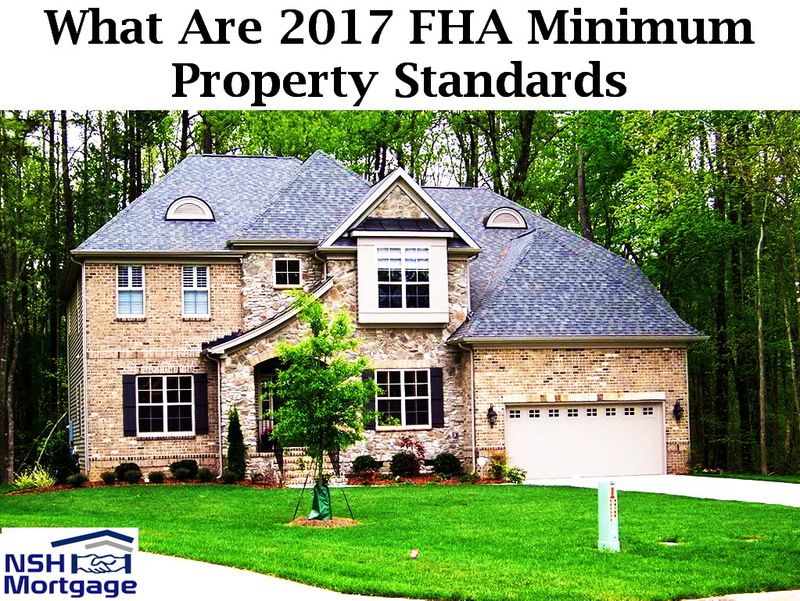 NSH Mortgage has the knowledge and tools to help you meet the required FHA minimum property standards of 2017. The term FHA mortgage is not complete accurate, because technically, FHA loans should be called FHA insured mortgages. Private mortgage lenders actually fund FHA home loans, and the Federal Housing Administration (FHA) covers their losses if borrowers default. FHA loans are popular among U.S. home buyers and refinancing households. However, FHA mortgages do have very strict rules about the current update property conditions, and it will not insure any homes that fail to meet these basic safety and habitability requirements. Home buyers wishing to use FHA backed financing should keep this in mind, because the property they finance will have to meet these minimum standards. FHA insured homes must exist as single, marketable pieces of real estate. In fact, you cannot get a loan against a bedroom or kitchen within a given home, or an in-law apartment that is part of a property. A FHA insured property must be accessible without trespassing on an adjoining property. So, if the property is not directly accessible via public ways, the owner must obtain an easement providing direct access. All FHA insured homes must be accessible for either a pedestrian or vehicle from any public or private street with an all weather surface. If the access street is privately owned, a homeowners association or agreement with other homeowners must cover the maintenance. The FHA requires that its insured homes be free of health and safety hazards. Therefore, the property must not contain excessive pollution, radioactive materials or mudflows. However, homeowners can apply for additional financing to mitigate these conditions and make the property safe. FHA mortgage guidelines require full height walls separating structures on a property, or at the property line. If the full height wall is an outermost exterior wall, there must be enough space between buildings for wall maintenance. Grading must ensure that the water properly drains away from the building surrounding perimeter walls, and as a result, does not flood or pond on to the property. The FHA does not allow defective construction or poor workmanship. Therefore, a FHA appraisal must not find continuing building settlement, excessive dampness, leakage, decay, termites or any other condition that impairs safety, sanitation or structural soundness. FHA insured homes must have water tight roofs, and also no evidence of leakage or missing tiles, shingles, or flashing. A FHA insured property must accommodate acceptable space for living, sleeping, cooking and dining. In addition, it must also provide sanitary facilities, including bathrooms with showers or bathtubs. FHA homes must reliably supply safe drinking water. Also, FHA houses must provide sanitary facilities, safe sewage disposal, adequate heating, indoor hot water, and electricity. Water, gas, electric and sewer services for FHA insured properties must be independent, because residents must be able to pay for and manage their own utility usage. In addition, homes in multiunit buildings with shared utilities must each maintain a separate shut off switch. However, it is okay to have common services including laundry facilities, storage space or heating. The attics and crawl spaces of a FHA insured home must have the proper natural ventilation to reduce excess heat or moisture that can lead to structural decay or deterioration. Crawl spaces must be accessible and clear of debris. FHA Minimum Property Standards protect both U.S. homeowners and the Federal Housing Administration. FHA approved appraisers know what these standards are, and your appraisal will note any deficiencies. By contacting FHA mortgage lenders, you can learn about property standards and find out what today’s FHA mortgage rates are. By shopping and comparing mortgage quotes from several competing lenders, you can increase your chances of finding the best rate and loan terms.